This standing Loupe is made of durable Lexan, with a built-in reticle for detailed measurement of the smallest blood stains. The glass lenses may be cleaned internally by simply unscrewing the top! 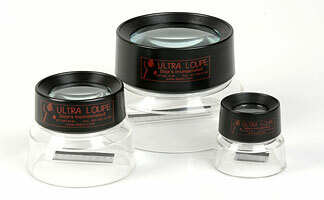 Sadly, this 5x loupe is being discontinued. Once our stock is depleted, we will no longer be carrying this standing loupe. The price has not been updated and Doje's will keep this price until stock is depleted.